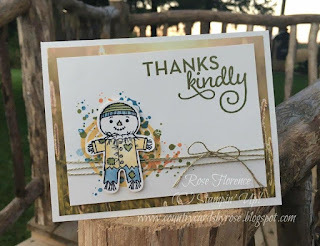 Welcome to the One Stamp At A Time (OSAT) blog hop! You might be arriving here from Anna Smith's blog or you might be dropping in for the first time here. Regardless of how you got here, please make sure you scroll down and click the NEXT button so you can continue the hop. Today is Throwback Thursday, and we've got some great Throwback projects for you this month! 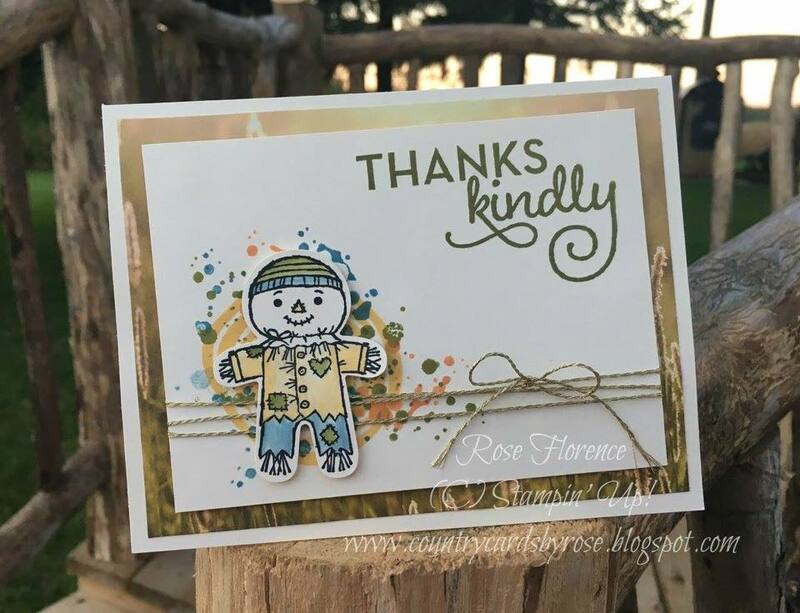 Each blog will show you a card and a 3-D item such as a gift bag, box, treat holder, or home decor item - the sky is the limit! You'll be sure to get lots of variety with this very talented group of stampers! Here's what I came up with - an adorable Halloween Card and a treat box to go with it! 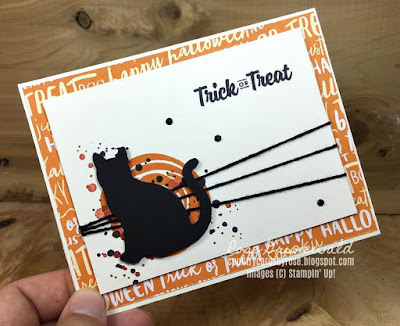 I used the SPOOKY CAT BUNDLE and SWIRLY BIRD for the card. For the box, I used our new MINI PIZZA BOX and EVERYDAY LABEL PUNCH. This card is a Throwback for me because I used the layout from this card I made last fall. The product is retired now, but that doesn't mean I can't CASE the design! 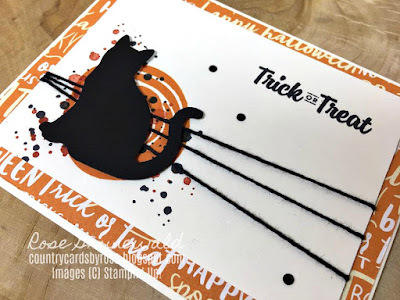 Do you love the Halloween paper I used on my projects? 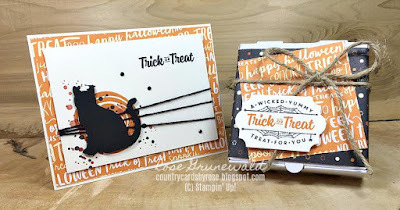 It's from the SPOOKY NIGHT DESIGNER SERIES PAPER STACK! 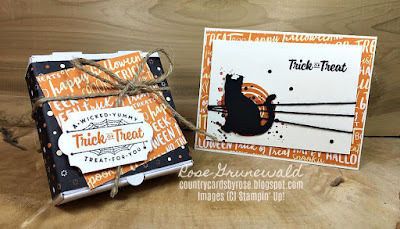 I am in love the colors in this paper - Very Vanilla, Pumpkin Pie, Cajun Craze, and Basic Black. Spooky Night DSP - 5 3/8" x 4 1/8"
Very Vanilla - 4 3/4" x 3 1/2"
Now for the box - this was so incredibly easy to put together. I used a new MINI PIZZA BOX. These boxes come with 8 in a pack, and they are the perfect size for one of those adorable cutout cookies (they are food safe!) that you drool at in the bakery or some 3" x 3" note cards. Some more of that stinkin' cute SPOOKY NIGHT DSP makes decorating this box ridiculously easy! I just wrapped it around the box, wrapped some of our new JUTE TWINE around and tied in a bow, then slipped a 3" x 3" layer of dsp under the twine. I used two dimmensionals on top of each other to pop up that tag over the tail of the Jute Twine bow. 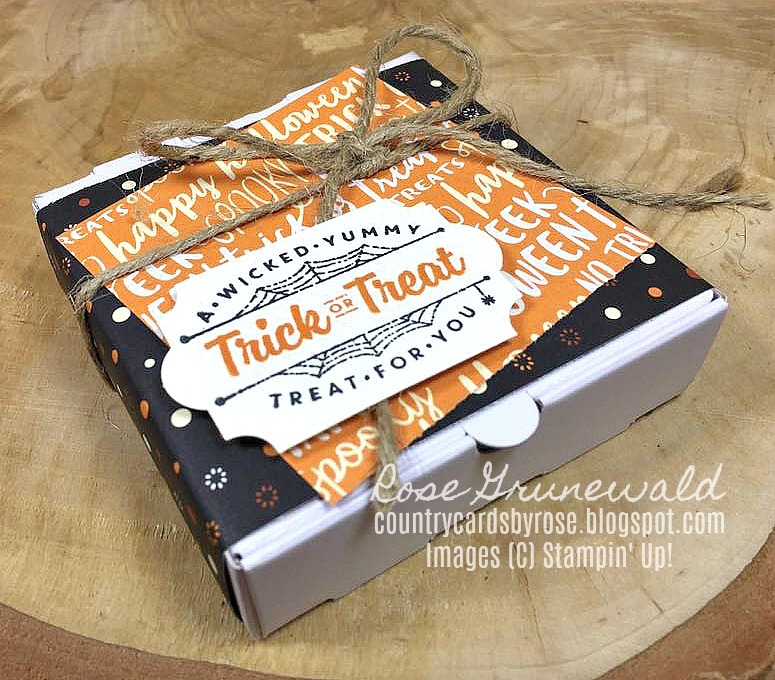 I'm really excited to find the perfect Halloween cookie to put in this box and gift my cute box and card to someone! Maybe I'll make a few more and give to my team at work! Thank you so much for taking the time to check out my Throwback Thursday project! If you don't have a Stampin' Up! demonstrator, I would be thrilled to earn your business! You can just click on the product list below to go directly to my online store. I send a special thank you with every online order, and you get an invitation to my private VIP page where you get access to exclusive project tutorials, can play games, and win prizes! We have a lot of fun there! 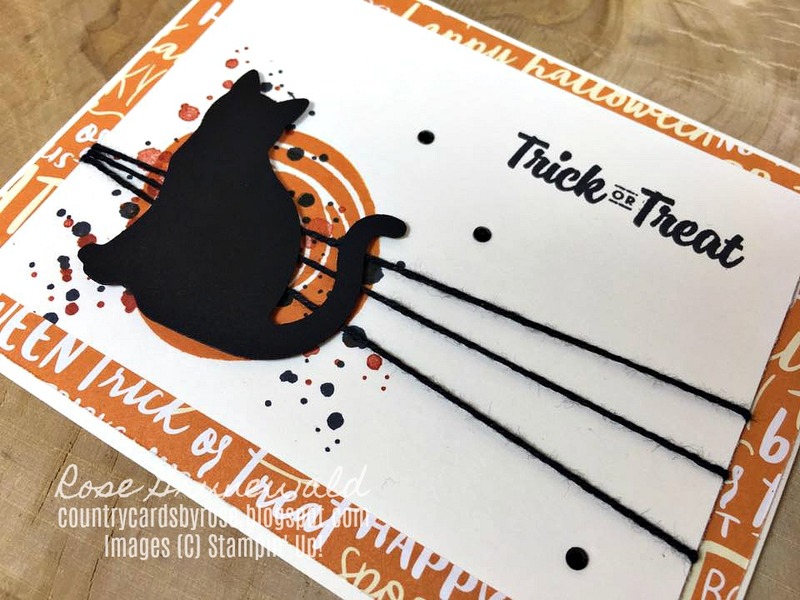 Make sure you use my September host code ST2FVAZ3 to be entered in a drawing to win a FREE stamp set! If you haven't liked my Facebook page, make sure you do that and turn on notifications so you are up to date with the latest and greatest form me! Please click on the NEXT button below to see what Maria Willis made to share with you today! You can click on any of the products below to go right to my store to purchase or to get more information!